The journal 'Entomologia Hellenica', published for the first time by the Hellenic Entomological Society (HES) in 1983, examines all branches of entomology and acarology. 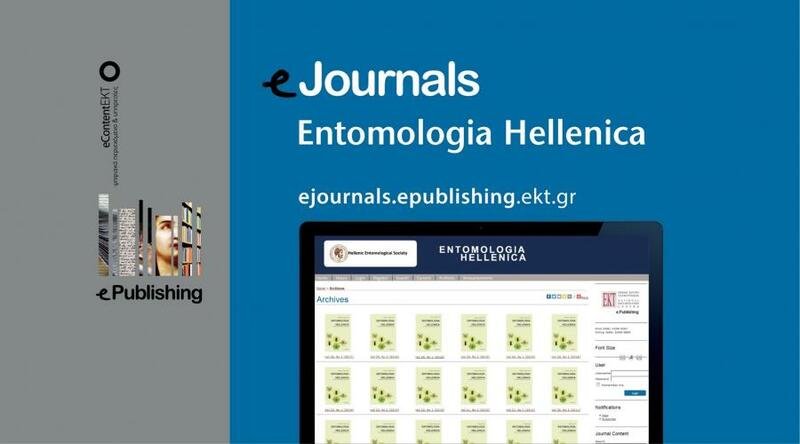 Uploading of the scientific journal "Entomologia Hellenica", published by the Hellenic Entomological Society, to the National Documentation Centre’s (EKT) eJournals platform was recently completed. Under the co-operation agreement between the two bodies, EKT provides the infrastructure for the electronic publication of the journal, while HES is responsible for the scientific content. The online version of the journal makes more than 217 scientific articles of a high standard openly available to researchers and the public. The journal’ Entomologia Hellenica’, published for the first time by the Hellenic Entomological Society (HES) in 1983, examines all branches of entomology and acarology. To date, the journal numbers 26 volumes (33 issues), all of which are freely available to the public at https://ejournals.epublishing.ekt.gr/index.php/entsoc/issue/archive?issuesPage=1#issues. Visitors wishing to learn more about the latest developments in entomology can search the 217 plus open articles for the material they are interested in, find out how to submit their work to the journal or how to submit their work for review. At the same time, taking advantage of the online environment of EKT’s ePublishing, the visitor can carry out single search of and navigate the full content of the online publications available on the platform, some 8,400 articles and a great number of books and conference proceedings. EKT’s innovative actions and initiatives for electronic publications result from the institutional role of the organisation in the collection, open availability and promotion of scientific output of the country and strengthen the organisation’s vision to contribute substantially to the transition to new digital research models (open science) using new technologies. To this end, ΕΚΤ ePublishing, which comprises 3 individual platforms for journals, conference proceedings and books-monographs, is constantly expanding its collaborative network with reputable scientific publishers. The Hellenic Entomological Society (HES) is interested in promoting the Science of Entomology. It ensures the development of entomology in Greece, the expansion and dissemination of knowledge related to the existence, distribution, ecology, physiology, ethology and generally the life of insects, mites and other arthropods, particularly those harmful to plants, animals, agricultural products and people. The Society is also interested in the study of beneficial and productive insects, their enemies and illnesses, and the protection of the environment from inappropriate use of every natural means, insecticides and other chemical substances.